Extra wide claw. Beveled nail slot. Bar is drop forged and heated for superior strength during prying, digging and tamping with hexagon steel construction for enhanced strength. Gooseneck pattern. Ideal for basic demolition work; 3/4" diameter high-carbon steel; slotted claw and beveled ends for functionality and performance. Made of forged, high-carbon steel able to withstand 975 ft-lbs. of bending momentum; with a slotted claw, beveled ends and high-visibility, powder-coated finish. 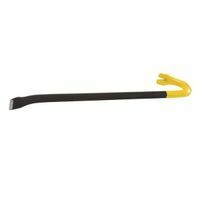 Ideal for basic demolition work; 3/4" diameter high-carbon steel; slotted claw and beveled ends for functionality and performance. Ideal for basic demolition work; 3/4" diameter high-carbon steel; slotted claw and beveled ends for functionality and performance. Rounded 90 degree prying end for leverage and prying; tri-lobe design for comfort and strength; multiple nail pullers for flexibility and nail removal; pointed beveled ends for penetration and nail pulling. One piece forged steel bar that serves as a 4-in-1 tool for prying, splitting, board bending and striking jobs. Made of tempered steel with a textured grip weighs 2.5 lbs. Made of forged, high-carbon steel able to withstand 975 ft-lbs. of bending momentum; with a slotted claw, beveled ends and high-visibility, powder-coated finish.